Heat oven to 350°F. Lightly spray cookie sheet with nonstick cooking spray. Unroll dough onto sprayed cookie sheet to form 12x10-inch rectangle. Starting with short end, fold dough in half; press lightly. In small bowl, combine oil and minced garlic; mix well. Spread over dough. Sprinkle with salt and rosemary. Bake at 350°F. for 20 to 25 minutes or until edges are golden brown. Meanwhile, in medium bowl, combine all salad ingredients; mix well. Refrigerate 15 minutes. To serve, cut warm focaccia into 4 pieces. Split each piece to form 2 layers. 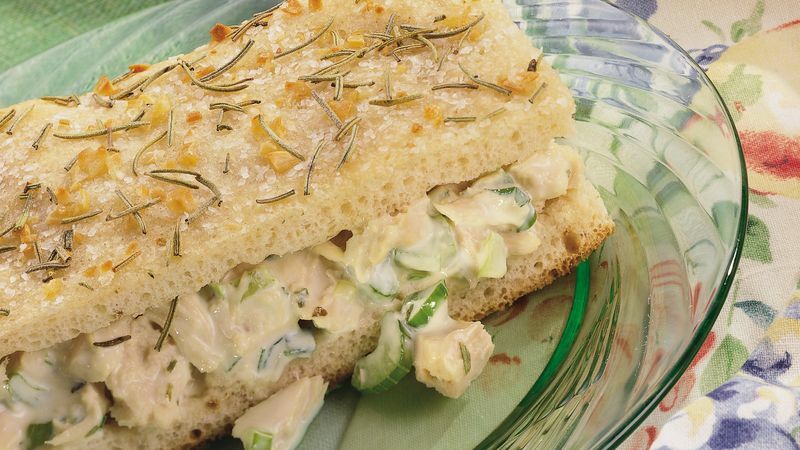 Spoon and spread salad on bottom halves of focaccia pieces; cover with top halves to form sandwiches.